I’m not sure how the quote “the best things in life are free” initiated, but this phrase is certainly true of Kauai’s wonderful sights. Kauai is arguably the most scenic Hawaiian island. Hey, there is even a song about Kauai aptly entitled Beautiful Kauai! Kauai is stunningly beautiful with its rugged green cliffs of the Na Pali Coast, uncrowded beaches and Waimea Canyon. You’ll practically find a postcard-worthy scene everywhere you turn. These two adjacent parks are phenomenally beautiful and not to be missed. You’ll find many scenic lookouts that are easily accessed from the main road. If you’re interested in diving a bit deeper into these surroundings, you’ll find miles and miles of hiking trails that reward you with almost unimaginable views. For more information, see these details and tips for visiting Waimea Canyon and Kokee parks. 2. See the gorgeous waterfalls. Now, who doesn’t love a waterfall? Kauai has many picturesque waterfalls and most of them are easily accessible. The photo below is of Wailua Falls is my favorite. It’s located on the East side of the island near Lihue. Another pretty East side waterfall is Opaekaa Falls. Both of those beauties are part of the Wailua River Valley, which also offers more history and pleasant views. When you are on the North shore around the Princeville and Hanalei area, be sure and look towards the mountains to see many tall, pencil-thin waterfalls. I particularly love the quiet North shore beaches. Kee, Tunnels, Hanalei Bay, Anini, and Lumahai beaches are all real beauties! Be careful as North shore beaches can have dangerous waves and currents, particularly in winter months (generally, November through March). When in doubt, it’s best to watch the waves from the shoreline rather than get into them. Always check the Hawaii Beach Safety site for up to date conditions and warnings. This North shore site is another picturesque point worth a visit. See this link for a photo, directions and tips for seeing Kilauea Lighthouse. Another favorite hike of mine is the Canyon Trail at Kokee State Park. It is a beautiful trail that takes you into Waimea Canyon for a 360 degree view of the canyon. Spouting Horn blow hole is probably the most dramatic blow hole you’ll find across Hawaii. It is also one of the easiest to find and access. It’s located on the South Shore. With Kauai being dubbed the Garden Isle, a garden tour might be appropriate. Even if you don’t have a green thumb, you’ll surely be impressed with the variety of tropical blooms. Though there are two gardens (Allerton and McBryde) that you must pay to tour on the South shore of Kauai, there’s ten beautiful acres around the visitor’s center for these two gardens that are free to visit. Take note that the entrance to this garden is across the road from Spouting Horn, so it make make sense to visit the two on the same day. Okay, I admit I may be sounding like a broken record, but watching sunset in Hawaii is something I advise everyone to do. It’s such a relaxing and beautiful event to watch. It can be even more memorable when you have a sunset picnic. I particularly enjoy watching sunset from Princeville with the “Bali Hai” peak in the background. (Click here for a photo of sunset from Princeville.) Another place that’s great for sunsets is Poipu Beach. 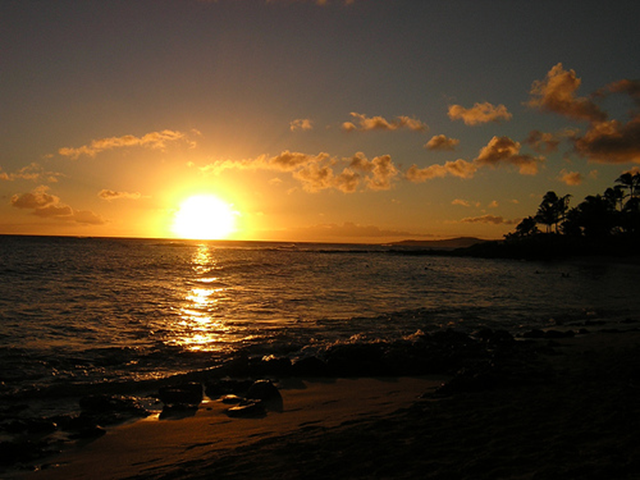 We took the photo on the left during a sunset picnic at Poipu Beach. On the eastern side of the island, you’ll likely notice Nounou Mountain. This mountain looks like the profile of a giant sleeping on his back. Hawaiian legends say that local residents tricked the giant into eating food that had hidden rocks. The giant laid down to sleep and hasn’t woken up since then. See our article on viewing Sleeping Giant. We’ve conveniently packaged all the above activities into a one week Kauai vacation itinerary and vacation planner. So, as you can see, there are plenty of free activities on Kauai. You could stay busy for days just looking at beaches and waterfalls and hiking. You can also find quality entertainment on Kauai that’s absolutely free. See our post on where to find free entertainment in Hawaii. Please pardon this non-free moment, but I feel that I would be remiss if I didn’t mention that there are some paid tours that you really must do when you visit Kauai. See this list of the 3 Kauai activities that are not to be missed. Those paid activities are unique to Kauai and worth the money, if your budget allows. This article is the third in the series of the best free or almost free things you can do in Hawaii. In case you missed them, you can also read my top picks for Maui and Oahu free activities and Hawaii’s Big Island. Your great list of free things to do on Kauai would work for any of the Hawaiian islands–visiting the state parks, beaches, hiking, and viewing the sunset. You can even find a lighthouse to see on every island. This link has several Hawaii lighthouses and descriptions. I have enjoyed all of those things on all of the different islands and I did not mean that your list categories are a generic one size fits all. Of course I rely on Go Visit Hawaii to tell me the best place to do all of those things on each different island! Hi John – that condo is at Puu Poa in Princeville. It’s located just next door to the Princeville Resort Hotel. It’s unit number 409. It was a wonderful condo and I’d stay there again in a heartbeat. I haven’t made it to Hawaii yet, but this post gives me plenty of ideas on what to do when in Kauai. Thanks! And I must say, the sunset photo is one of the most beautiful sunset pictures I’ve seen. By the way, I like your new design. Haven’t been here since last year. When did you redesign? You’ll love Hawaii when you go! Watching and photographing sunsets never gets old. Glad like the new design! We changed about 2 weeks ago. Thanks for the great list. We’re taking our first trip to Hawaii (Kauai & Oahu) in June. We can’t wait! I love this site. Now I really have to get to Hawaii. Aloha Coretta and welcome to Go Visit Hawaii. It’s music to my ears to hear that you want to go to Hawaii. It really is a special place. Please feel free to ask questions as you prepare for your trip to paradise! I live on kauai and somehow stumbled upon this page. Noone can really see all of the beauty of kauai but those are the best places that i would reccomend. Thank you planning on Visiting in March already book hotel and flight cant wait! I am addicted to Kauai and love every inch of it! “Allerton Gardens”. It is not free but it is worth the cost.It is one of the most beautiful botanical gardens I have ever visited. Be sure to call ahead for reservations. This is a great site, I just wanted to thank you for the list compiled on what to do in each island. I visited all the four islands last month 10/09 and did most of my research via the list you had provided. (Practically i knew what to do in all the islands via your travel blog). As a reader mentioned you should include a visit to the hanelei pier in kauai which I would say you should try and see. Mahalo for your kind comments. It’s readers like you who take the time to let me know that my articles helped you have a great vacation, that inspire me to continue writing. Appreciate you echoing Hanalei. It is gorgeous there for sure! Please allow me to iterate the positive nature of your website. I’ve been to Kauai several times and learned a lot from you. My sweetie will be visiting with me this spring and he’s never been.All he has to do it visit your site to know that my choice of zen spots is the right one. You’ve given me a way to show him the best of this amazing natural wonder, and I thank you very, very much for it. Hang in there, try really hard to ignore the one-uppers,, and keep doing the great work you’re doing. I love your spirit. Take care. Thanks for the encouragement, Lisa! I’m excited to use your list for our trip for our 10th anniversary in May thanks for your time in writing this!!! I am going to Hawaii next week for four island. I have booked car rental and planning take GPS with me. It would be great if you have address of each place on one page (for each island) so that one can enter them in GPS and just go … btw, the site has wealth of information and I plan to use it to the fullest as it is my first trip to paradise. Great job. keep it up. I will be coming to Kauai on the 28th of Dec for two weeks with my family. We have never been and we are looking forward to it. We shall try and get in all or most of your 10 activities. I’m glad to see that many of the free activities we had on our list, you recommend. I’m adding the Kauai Coffee company one though for the husband. He will love it! I have been to Kauai several times but haven’t been back in a few years. Your pictures bring back so many memories and you are right there is so many free activities that you can do there. It is truly a gorgeous destination. My brother and his girlfriend actually just got engaged there a month ago on the tip of the North Shore at the Napali Coast. I’ve always wanted to go to Hawaii, but when I do I will make sure to swing by Kauai this place looks beautiful and all these activities are free!? How could i pass this up? Awesome post!